Winter is approaching once more, a chill is creeping back into the air and the days are becoming ever shorter. It can be a gloomy time for many, but the Mediaeval Baebes are bringing some magic and light into this dark season. Having enchanted audiences at Loxwood Joust in August, the internationally renowned choral group returns to West Sussex on December 8 for a special concert at St Mary’s, Horsham. It’s part of the Christmas Carol Tour, which takes festive classics to the UK’s most beautiful cathedrals and churches. Songs have been selected from the Baebes’ 2013 album, Of Kings & Angels, alongside other contemporary and traditional pieces. Singer Marie Findley believes that performing in religious venues truly brings mediaeval music to life. “Often music is devotional so it’s specifically written to be sung in a church or cathedral for the glory of God,” she says. The setting also lets the Baebes perform more intimate shows, engaging audiences fully with their stirring, ethereal melodies. They’ve certainly made a name for themselves over the past 20 years. 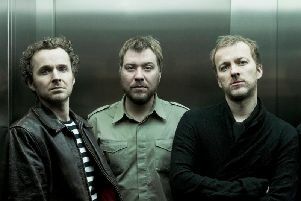 Three of their albums have entered the top of the classical charts and their contribution to the BBC’s Virgin Queen soundtrack, composed by Martin Phipps, led to an Ivor Novello Award. More recently, fans of ITV’s Victoria will have heard the Mediaeval Baebes’ haunting voices on the title sequence. Working with Martin Phipps again, this earned the group two Emmy nominations. So it’s surprising that Marie didn’t have professional singing ambitions before joining in 1996. “I met Katharine Blake (musical director) in a field,” she says, explaining that she approached a young woman singing to herself at a festival. Impressed, Marie asked Katharine what the music was and learned that it was mediaeval. “I expressed my fascination and she just turned around and asked ‘do you want to join my band?’. “She didn’t know whether I could sing. I guess I must have had the right look,” Marie laughs. The next week she turned up for rehearsals and six months later the girls landed a record deal, releasing their debut album Salva Nos in 1997. Marie had studied performing arts – theatrical training at De Montfort University – so the band was a great chance to show off. “That’s always been a big motivator to me,” she says wryly. But, joking aside, Marie had a genuine interest in the Middle Ages and pushed to make dancing part of the act with the help of a historical choreographer. As Marie says, in our technology obsessed modern age it can feel like we’ve lost these things. The Mediaeval Baebes offer a way to reclaim them. However, despite her passion for the group, Marie hasn’t been a member for the whole two decades. She left in 2007, relocating to New York when her then husband Torsten Luth became senior vice president of Atlantic Records. She still has dreams about the experience but, now 45 and living in London, Marie’s thrilled to be back with her band. There’s a new album to look forward to as well, one that’s full of nursery rhymes. Like much of the Baebes’ work it’s an intriguing musical document of English folklore and history. It’s business as usual then – captivating songs in a variety of languages, all performed by seven fair ladies in long, flowing dresses. But maybe there’s one difference. The St Mary’s church, Horsham, concert starts at 8pm (doors 7.30pm). Tickets cost £25 from www.mediaevalbaebes.com.